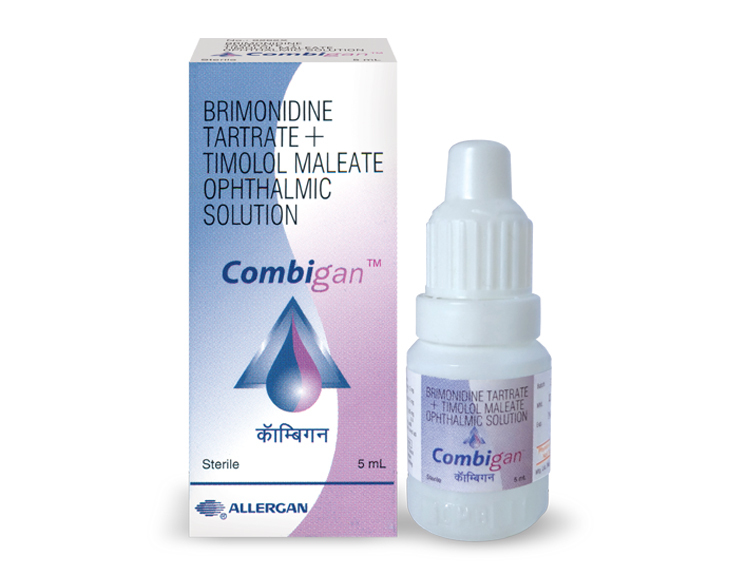 COMBIGANTM (Brimonidine Tartrate and Timolol Maleate Ophthalmic solution) is a alpha-2 adrenergic agonist with a non-selective beta-adrenergic receptor blocking agent. The recommended dose is one drop of COMBIGANTM in the affected eye(s) twice daily. If more than one topical ophthalmic product is to be used, the different products should be instilled at least 10 minutes apart. COMBIGANTM (Brimonidine Tartrate/ Timolol Ophthalmic solution) 0.2%/0.5% is indicated for reduction of elevated intraocular pressure in patient glaucoma or ocular hypertension who are insufficiently responsive to topical Beta Blockers. COMBIGAN™ is supplied sterile in 5 mL white plastic bottles.